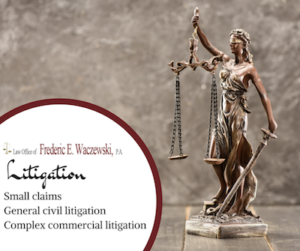 If you or your business are being sued, act quickly and hire the services of Law Office of Frederic E. Waczewski, P.A. as there is a time restriction of 20 days from the moment that you are served with a lawsuit in which one can respond to it. Our law firm has the vast experience in civil and commercial litigation to put your mind at ease. Always remember that a corporation MUST be represented by an attorney in court whereas an individual may represent his or herself. If you believe you have a valid claim against an individual or a business, we will evaluate your case and determine if it is suitable for litigation. We spend a lot of time evaluating your claim so that if we decide to file a lawsuit on your behalf, we maximize your chances of winning. General civil litigation: Civil litigation occurs when two or more parties find themselves in a legal dispute where one seeks to recover compensation for damages or to establish their legal right over an issue. These cases must be tried in a civil court. A trial lawyer such as those at our law firm will be very familiar with the process and know when to file all items accordingly. Complex commercial litigation: in this type of scenario two businesses are having a dispute over property or money. When a trial lawyer in Orlando, FL is needed to help maneuver through the complexities of these types of cases, one will be most benefit from a litigation lawyer who has successfully tried and won hundreds of cases in the courtroom. That is where the Law Office of Frederic E. Waczewski, P.A. can provide their expertise and help resolve disputes. Small claims: bringing a case to trial can be expensive and time-consuming for some, which is where the more informal process of a small claims case can truly benefit some of our clients. In these proceedings, the client can share their arguments directly with a judge. Utilizing an attorney to help you build a strong case and obtaining the justice you deserve is quite valuable in these types of scenarios. Ensure that your assets and rights are protected. Contact our litigation lawyer now to seek help with your dispute. If you feel you have a valid claim, contact an attorney from our law office right away.